You probaly know that Magento uses EAV database structure for categories, products. In some cases this solution is not the best or fastest. I will get you here example how to speed up product collection. 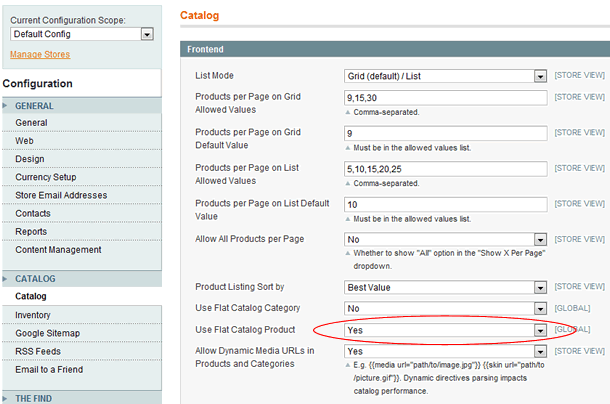 Magento has config option: “Use Flat Catalog Product”. In order to see this option, go to Magento admin section and click on: System -> Config -> Catalog and Frontend. If you enable this option, you will adjust Magento to use “Flat resource” for product collection. Take a look at product collection class “Mage_Catalog_Model_Resource_Eav_Mysql4_Product_Collection” you will see a method “_construct“. without EAV database structure. SQL queries will be simplier, faster and you would need to have better performance on product listing. This method returns flat table name and it depends about current store. Flat table name for store_id “1” is “catalog_product_flat_1“, below you can see method which is in charge for giving current table name. For every store you will have one flat table. Thanks Brother…Article is very helpful. I have enable the flat catalog category but facing some problem. Its changing my top menu and left menu to the default menu which was in template. Please let me know how can i resolve this issue. @Ted Fuller – Before you activate this, you should go to System -> Index Management and Reindex both Flat Categories and Flat Products indexes. Also make sure you keep this indexes up to date. After enabling flat catalog I am seeing old featured products on the homepage. Is there something I’m missing here? xbb, Piotr they are doing it for their own gains 😉 but still they are educating the people. 1 article, 3 comments with 2 questions, no answer from author. Yes, it would be interesting to know the downsides of a flat product catalog. As someone who’s expecting to run into performance issues in the near future, I dont suppose you could give a brief summary of the pro’s and cons of using these flat tables – or post a link to somewhere that does detail this?